Good morning! How are you all doing? 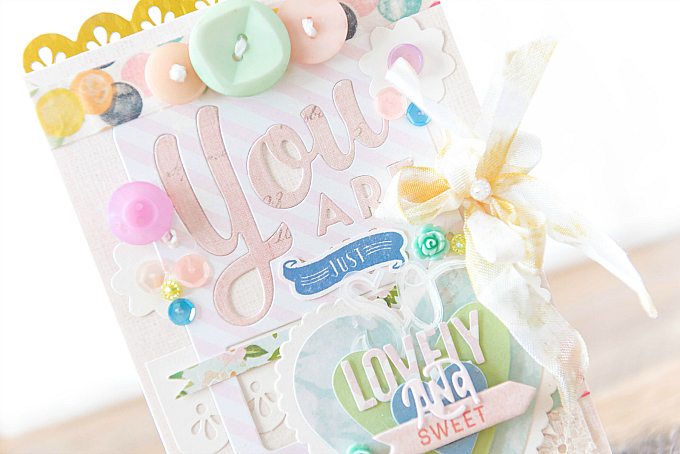 Today's post is all about layers and I am SO excited to be sharing this card with you. I've been trying to create with fewer layers lately, so it's been super fun to jump back into the way that I used to make all my cards. Layered, intricate, and full of embellishments! If you struggle with layers, or are just interested in trying something new in your crafting, read on below and I'll share some of my tips on how I work with layers. This is how I establish the theme and colors of my cards. I create some small embellishment (such as the layered heart on this card) and then I work around it to slowly build the rest of the layers. It's a little counter-intuitive, but it works wonders. For this card, I used PTI's Limitless Layers: Hearts and Heart Prints to cut a variety of sizes, which I then layered together. Because the base of my heart was a scalloped cream cardstock, I knew that whatever was underneath that heart needed to have a bit of color, as opposed to being layered onto a white base. I didn't want too much color infused into the card, so I knew that it would have to come from itty bitty pieces that would just barely peek out from under all those layers. Which brings me to tip #2. Layering with a variety of small strips creates a card that is airier, lighter, and more intricate. Using larger pieces creates a simpler and cleaner look. I love to do both, but for this type of card, I just find that small little bits really do add to the texture of the card! 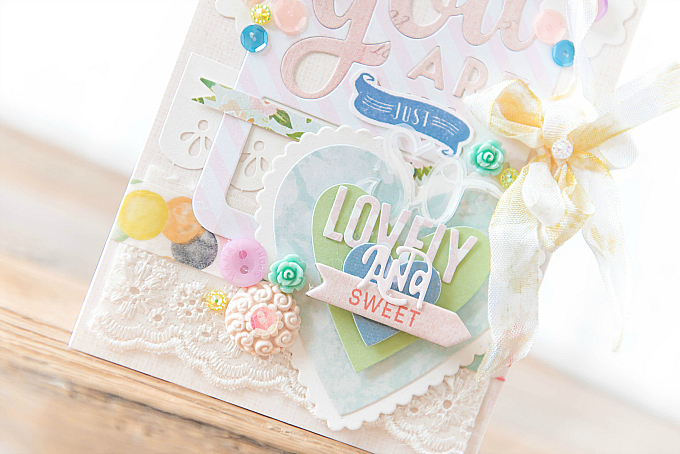 If you look closely under the heart embellie of this card, you will see that I used lace, colorful washi tape, a floral banner, and that a part of the heart also overlaps the striped die-cut, and the lacy cream border. This all brings me to the next rule of thumb. If you look closely at my card, you will notice that I repeated a few colors in a triangle formation, in order to create design balance. For example, look at the lilac color, added in three areas, in the form of buttons. Next, look at the yellow. 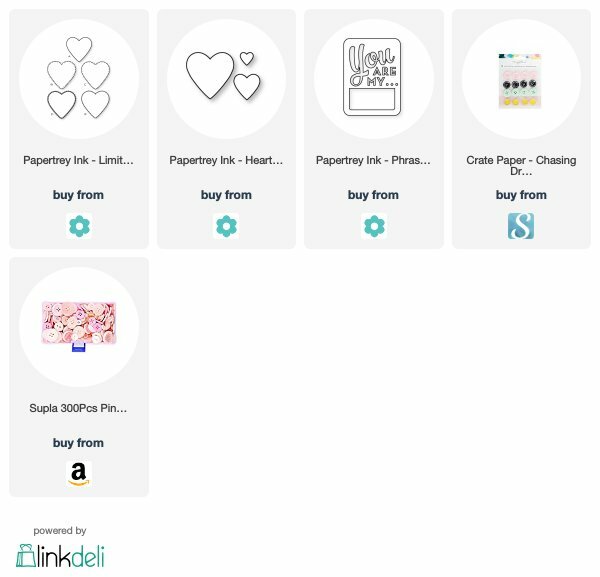 It comes in the form of a washi tape polka dot on the upper left corner, as well as the lacy border at the top of the card, then in the form of the soft bow, and lastly, another washi tape polka dot on the lower left corner. The wee little colorful rhinestones do not really count in this scenario, since they are overshadowed by the bolder details, but even they are arranged in a triangle! You'll also notice that I did not triangulate all my colors, just a few of the bolder ones, like the yellow, blue, mint green and lilac. 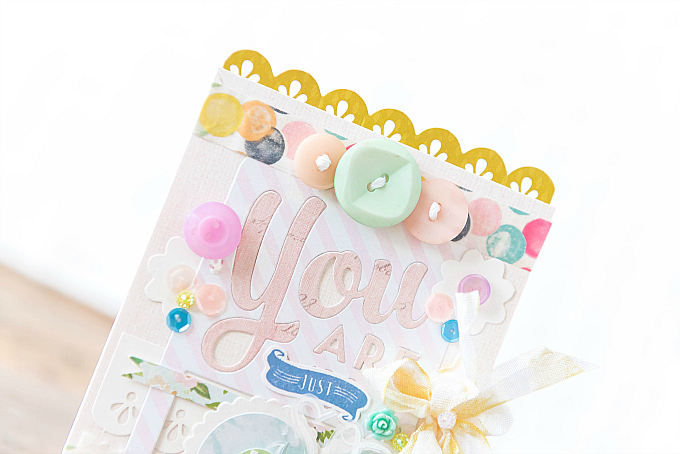 The soft pink is sort of added to the center of the card, and it nicely compliments the other bold colors. And that's it! I know it sounds like a lot, but if you use these tips when creating, pretty soon it will become second nature. Approaching very layered cards this way, helps me decide what color of embellishment to use next, and its placement. It really takes the guesswork out of the equation, and is a surefire way to feel more comfortable in working with complex layers. If layers scare you, I hope you'll give this a try! To create this card, I used a white card base, along with a lace border and polka dotted washi tape for the top. To that, I added three yummy pastel stitched buttons. Just below, I added a Phrase Play #1 die-cut journal card, in two tones - candy pink stripes and a soft blush. To the side of the card, I added a mix of buttons, sequins and rhinestones, as well as scalloped die-cuts from an older Stampin Up kit. Underneath the phrase play diecut, I added a scalloped border from the same Stampin' Up kit, as well as a soft yellow bow. I finished off the sentiment, by adding a mix of words, both die-cut and stamped. To the bottom, I added a cream lace, and a few more buttons and resin embellishments. I hope you've enjoyed today's breakdown of ultra-layered cards and I hope you'll give this technique a whirl sometime! Thanks for stopping in and for your sweet notes. Ivana, now that you've visited, you do know how fearful I am of layering anything!! lol ... I will take your welcome advice, and save it, just in case I ever want try again! Your card is a masterpiece! And you do those layers so well!! This is another of your lovely little works of art Ivana, just fabulous! Wonderful technique tips and gorgeous work of art!